Ceci Wong, owner of the jewelry store by the same name in downtown Menlo Park, thinks she might want to write her autobiography. And a quick perusal of her life’s journey bears that out. Born in Hong Kong. Educated in London. Lived in Paris and New York. Employed by Tiffany’s and Neiman Marcus before going out on her own. And, oh yes, robbed by pirates. We’re not certain there is a link between this experience and the fact that Ceci and her daughter, Chloe Lee, are enthusiastic ice hockey fans. They follow the Sharks, have become a corporate partner of the team, and designed a lovely Sharks pin. Mother and daughter also ice skate together. Where they find time for these pursuits is another matter, as they’re involved at the store, which opened at the end of 2014, most days of the week and always when it’s open Tuesday through Saturday. Both are GIA certified graduate gemologists. 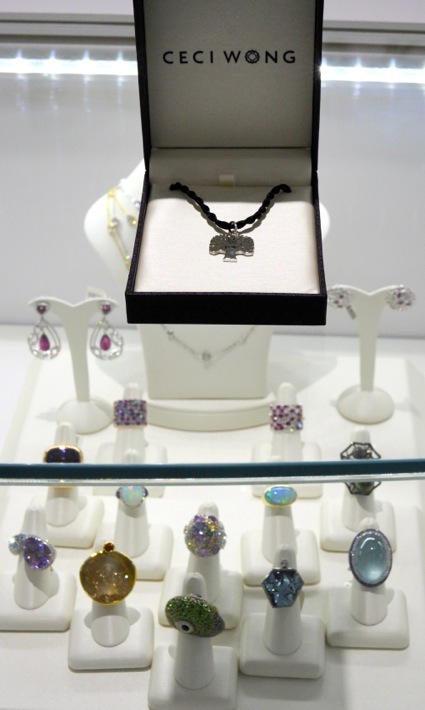 As locals are aware, Ceci opened her store in the nick of time with three jewelers — The Jeweler, Hirzel’s and Timothy Fidge — all disappearing from downtown Menlo Park over the past several years.